If the number of vacancies registered citywide is any indicator, a four-year experiment aiming to compel property owners to register vacant storefronts has failed. As as result, the city is mission out on the thousands of dollars it ought to have collected under an ordinance that requires landowners to register and pay a fee for empty spaces left vacant for more than 270 days. Fewer than 40 vacancies were registered with the city from 2014 to 2017, and only about $6,400 in fees were collected, according to city records. It was not until 2018 that the Department of Building Inspection registered more than 400 vacancies. Even then, the city collected less than $43,000 in fines that year, according to the department’s registry. Despite hundreds of vacancies now listed on the registry, only a few property owners have paid fees, because they have up to 270 days to fill their space after the first notice of violation is mailed to them. It is only after nine months that they are required to pay the $711 registration fee. It’s a loophole in the existing legislation that Supervisor Sandra Lee Fewer wants to close with her proposed bill on vacancies. Her legislation, introduced in December, will likely be considered by the Board of Supervisors in early February. And with six co-sponsors , Fewer’s office feels “confident that there’s a lot of support,” according to Chelsea Boilard, a legislative aide in Fewer’s office. In the meantime, the Building Inspection Commission’s Code Advisory Committee has given it a thumbs-up, provided a few small adjustments are made to the language. If approved, it would remove the 270-day grace period, require annual inspections at the owner’s expense if a space is not filled within a year of being vacated, and charge four times the registration fee if the vacancy is not registered within 30 days of the site becoming empty. If a building is vacant, “it will be considered vacant, regardless of putting up a sign,” said Ian Fregosi, another legislative aide in Fewer’s office. He explained that some building owners currently put a for sale or lease sign on vacancies to avoid registering, even if they do not intend to put it on the market. But even if the updated legislation is approved, it would require enforcement — something that existing vacancy requirements do not have. 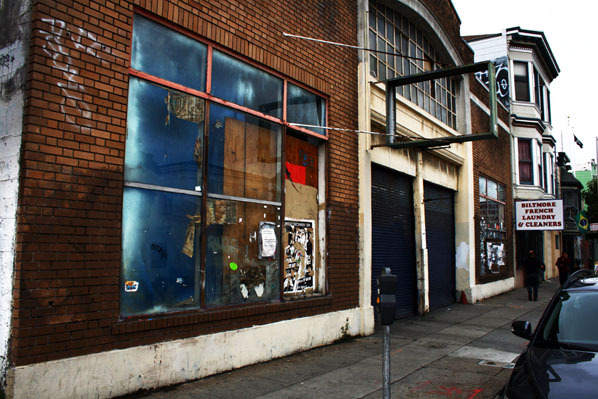 If current vacancy requirements were enforced, the city’s registry of vacant buildings should include all 50 commercial vacancies that Mission Local tallied in a recent count. The count included commercial vacancies along Mission Street from Duboce to Cesar Chavez, a 1.5-mile stretch. Of the 50 vacancies, only 13 are officially registered, and just two have paid the $711 registration fee. 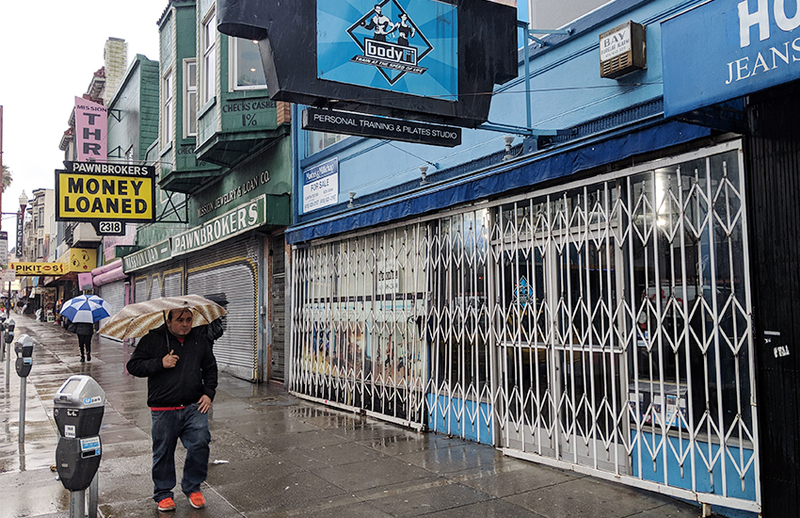 If all 50 vacancies on this portion of Mission were registered and vacancy legislation enforced, the city’s building inspectors could be collecting more than $34,000 in annual registration fees just from a 1.5-mile strip. One reason for the incomplete registry is that it is mainly complaint-based. Unless someone reports a vacancy to the Department of Building Inspection, it is likely to go unchecked. By requiring the registration fee up front, rather than 270 days after vacancy, Fewer’s staff hoped to create a revenue stream for the Department of Building Inspection to better enforce vacancies, according to Boilard. “Currently, they’re understaffed,” she said. Vacancies can have significant negative effects on communities, according to a recent report authored by Hayley Raetz, a student at the UC Berkeley Goldman School of Public Policy. Not everyone views the vacancy problem as an absolute negative, but rather a more complex issue. Bodyfi closed its doors in December, joining Mission Loan and Mission Thrift to form three consecutive empty properties on the 2300 block of Mission. Photo by Sarah Trent. A certain amount of vacancies is normal and healthy, said David Baker, an architect based in the Mission. But “sometimes, when a neighborhood is changing and rents are being raised, it becomes harder for small retail” to stay in business. This can lead to more vacancies in a place like the Mission, because “we have a very complex idea of what retail is appropriate,” he said. If a business does not meet the requirements, spaces often remain vacant. Fewer’s proposed legislation might lead to fewer vacancies if property owners want to avoid paying annual registration fees, but the end result could be the same as under current law: Property owners simply might not register. Fewer’s office is drafting an amendment to the proposed legislation that would require “property owners to submit a report showing they’ve had the property inspected” by a licensed professional if the property is still vacant after a year, said Boilard. This would be an out-of-pocket expense for property owners, in addition to re-registering annually. Rethinking zoning, beyond refilling a space with retail and streamlined permitting, would be complementary strategies that could lead property owners to fill empty spaces, Boilard added. That, Cornejo said, would be helpful. The 101 economic model says if there are lots of supply of empty buildings, – and there are – rents should decline. The common thought is, rent didn’t decline because tax loss strategies that help the big owners.. For tax reasons, the owner still make out like a bandit with the building empty, deteriorating, and harming the community. 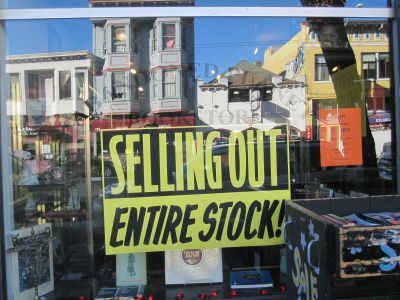 t also seems like San Francisco has some real percentage of the empty storefronts that are owned by elderly couple survivors, who bought the buildings by thrifty lifestyles, and are now confused and overwhelmed by the ownership in a complex situation. Non greedy folk. So I hope this law passes but that there is also someone in the City available for the Nǎinai and Abuellas who ended up owning one of these empty spaces. Great… more fees. That ought to do the trick. What tax reasons would that be? No owner will make out like a bandit miresi than with rent coming in. Because the property value continues to increase while the property tax stays the same (due to prop 13).